1. Wash and chop Ivy Gourd, Tomato and green chilies. 2. Heat 3tsp oil in a frying pan, add cumin, garlic cloves and chopped Ivy gourd fry them. Add green chilies, red dry chilies and onion fry them for few minutes. Add tomato and salt cook till soft. Switch off the stove and let them cool. 3. 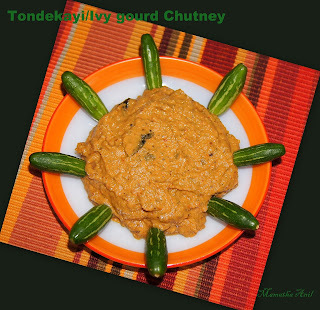 Take fried ingredients and tamarind in a blender, blend into smooth paste. Transfer into a bowl and season with cumin, asafoetida and curry leaves. 4. Yummy Tondekayi/Ivy gourd chutney is ready. It goes well with dosa, chapati and rice.